Arthritis is an umbrella term used to describe various disorders of the joints, which typically involve joint pain, swelling and stiffness. The most common forms of arthritis include: osteoarthritis, rheumatoid arthritis, gout, septic arthritis, ankylosing spondylitis (AS) and juvenile idiopathic arthritis. Osteoarthritis is also called, degenerative joint disease (DJD) and is the most common chronic condition of the joints affecting individuals as young as 30 years old. Within each joint is smooth connective tissue called articular cartilage. Cartilage covers the ends of the bones, which come into contact with one another to form a joint. This cartilage acts as a shock absorber, allows for smooth movement, and produces fluid, which lubricates and nourishes the joints. Osteoarthritis is a degenerative process in which the cartilage in the joint becomes progressively thinner and “worn down”. When the cartilage thins, the space between the two bones may also decrease, leading to joint space narrowing. Bone spurs, or osteophytes may also form along the joint margins, and can irritate nearby soft-tissues and nerves. The capsule, which surrounds and holds the joints together, may become thick, inflamed and less elastic over time. All of the above changes can lead to morning stiffness, impaired movement and pain. Any joint in the body can be subject to DJD or arthritis; the spine, hip and knee joints are the most commonly affected. 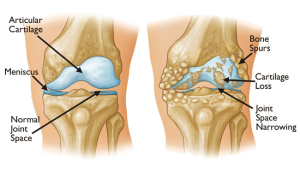 Being overweight, acute trauma and or surgery can speed up the process of joint degeneration. However, for most people osteoarthritis is a non-traumatic, slow, age-related process. The idea of “wear and tear” in reference to bone and joint degeneration or osteoarthritis is common. In the context of x-ray findings of osteoarthritis, patients and health professionals often attempt to draw the conclusion that what they’re seeing on the x-ray is a direct effect of physical punishment the patient had endured over their lifetime. When terms like “degeneration”, “breakdown”, and “destruction” are used to describe the process of osteoarthritis, we immediately attribute it to physical stressors or activities we’ve done in our younger years (i.e. : our occupations or sports we have played). However, your joints are not like your winter tires. It’s simple to draw the conclusion that the amount of time you use your winter tires is highly correlated with your tire treads wearing down but the same can’t be said regarding your joints. Over time, excessive demand on any joint in the body can cause some degree of degeneration but it is more likely that a joint will see degeneration of greater severity due to lack of movement. Most people’s jobs, activities, and exercises rarely force them to utilize their joints through their full range of motion. This leads to a decrease in joint mobility (stiffness), joint irritation and or muscle tension. If proper motion is not restored, the process of irreversible, degenerative change will occur much more quickly. When we don’t move our body, our joints are depleted of oxygen and nutrients, which causes the cartilage to break down more quickly. In this sense, movement is medicine since it will favorably affect the health of the joint. At Mountain Health and Performance, our chiropractors will diagnose the health of your joints through various examination techniques. Utilizing skilled joint palpation can easily determine joint mobility problems, which left untreated, put you at risk of injury with many occupational, recreational and competitive activities. Chiropractic care during your younger years will promote optimal joint motion/function and can therefore help reduce future wear and tear on your joints. We will educate you on correct specific joint exercises will also help you to maintain maximal joint mobility and maintain the effects of treatment. Typically an osteoarthritis diagnosis is made based on x-ray findings combined with clinical symptoms and examination findings. In many cases the extent of arthritic change does not correlate well with pain intensity. It’s important to understand that your symptoms, function & goals are much more important than the image when treating and managing arthritis. Joint manipulation improves joint mobility, decreases pain and decreases muscle tension. Active Release Technique (ART)/Functional Release (FR), & massage: These soft-tissue techniques will help to decrease scar tissue, improve blood flow and improve the overall health of the muscles and fascia. Laser therapy is a non-invasive modality, which has few associated risks or contraindications. Research in humans & rodents has found that laser may have a positive effect on pain and function for osteoarthritis. Some studies have found that patient’s experienced an increase in local blood flow, decreased swelling, and an overall self-reported decrease in pain following a trial of laser therapy. If your BMI puts you in the overweight or obese category, loosing weight can have a positive impact on your overall pain and disability. Book an appointment with our naturopath to learn more about utilizing nutrition for weight loss and improved health. Resistance training, cycling, swimming and aqua size are all great exercises that will help improve your cardiovascular health, lubricate the joints & help you to loose weight- without putting added stress on your joints.Try to avoid high impact activities like running, jumping, & heavy weight lifting. Find footwear that maximizes shock absorption and avoid high heels. Simple gel inserts work great! Our chiropractors are also trained in orthotic prescription and will advise you on whether or not this is an appropriate therapy for you. Anti-inflammatory and joint supporting supplements such as curcumin, omega 3 fats and glucosamine are great options for helping to keep your joints healthy. If you are taking prescription or over the counter medications It’s important to speak with your naturopath or medical doctor prior to starting a course of supplements to ensure there are no adverse interactions between the drugs and supplements. It’s important to understand that there are no hands-on treatment, exercise or prescription drug that can reverse the degenerative changes associated with arthritis. Treatment can help to decrease and manage pain, improve function and slow down the process of further degeneration – this is key to preventing long-term disability and poor quality of life. For example, if you are currently suffering from arthritis pain that is preventing you from walking or participating in physical activity you may increase you risk for other health problems including: diabetes, stroke, heart disease, & depression. In order to maximize the benefits of care, the frequency and duration of treatment is critical. A painful, arthritic joint does not occur within a day, week or even a year. It’s a long process that occurs over many years and and will therefore require a longer period of time to respond to treatment. Many conditions that we treat at Mountain Health & Performance may only require a short course of therapy however arthritis management is a longer process that requires patience and commitment. At Mountain Health and Performance we will provide the treatment and guidance with the long- term goal of maintaining optimal movement, decreasing pain and limiting future joint degeneration and disability.